My goal was to make the displays as interactive as possible. Thank goodness for Pinterest-about an hour trolling there gave me all the inspiration I needed. The rest was all about image finding, font decisions, and cutting things out (because I’m so not an artist, though I did draw the burst). Showing before and afters for the interactive displays. 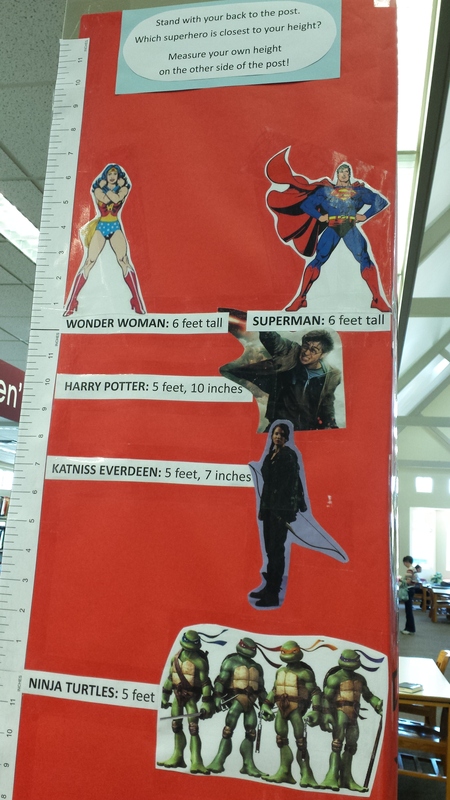 Blue side: they measure their own height and write down what their super power is. Hard to see, but at least 100 names on that post! 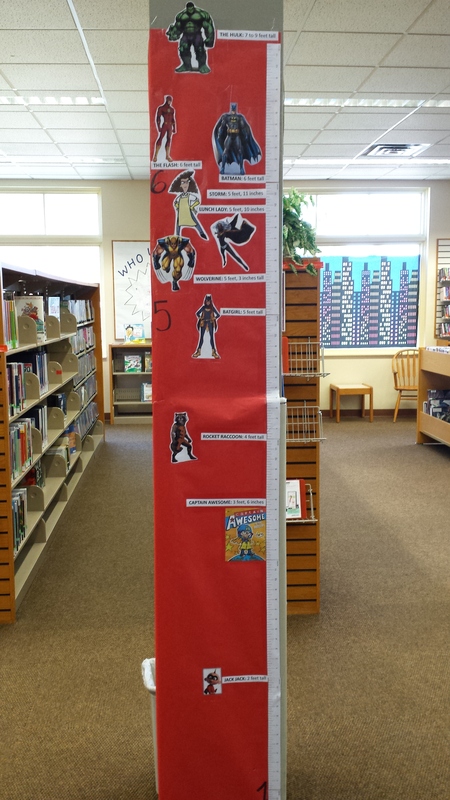 Red sides: feature heights of well-known, and some lesser known, heroes so kids can see if they are as tall as a superhero! 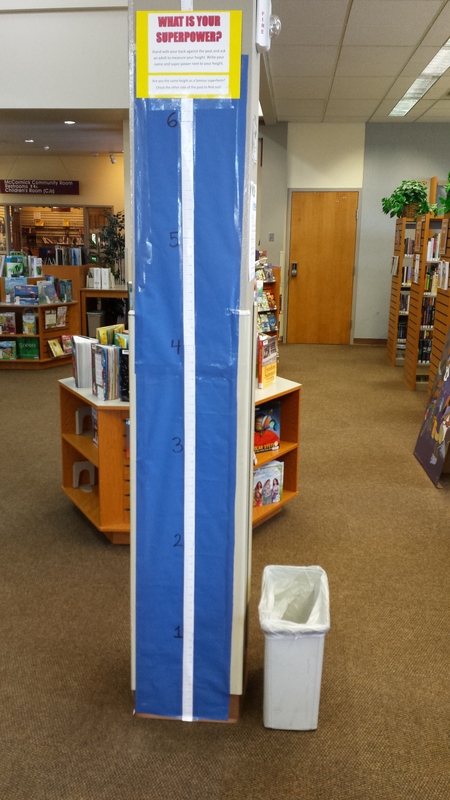 Kudos to my coworker for suggesting a Smurf-we can measure height in apples, too! 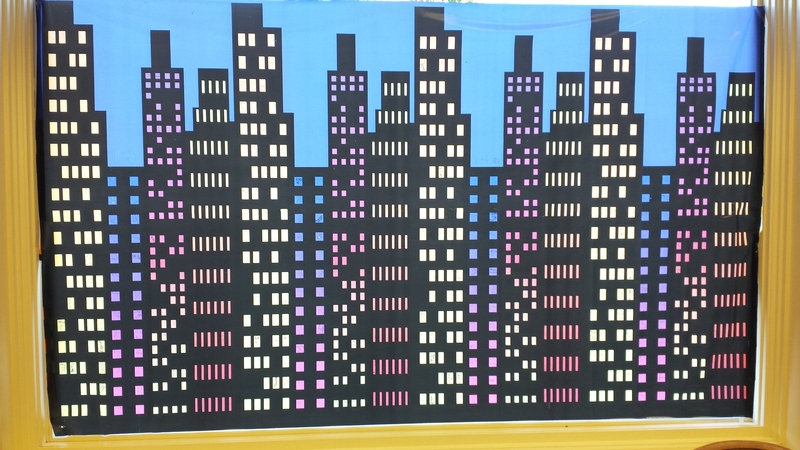 City Skyline in the Window: Every kids who completed the summer reading program got to put their name in a building window. They LOVED this. Maybe more than the goody bag. 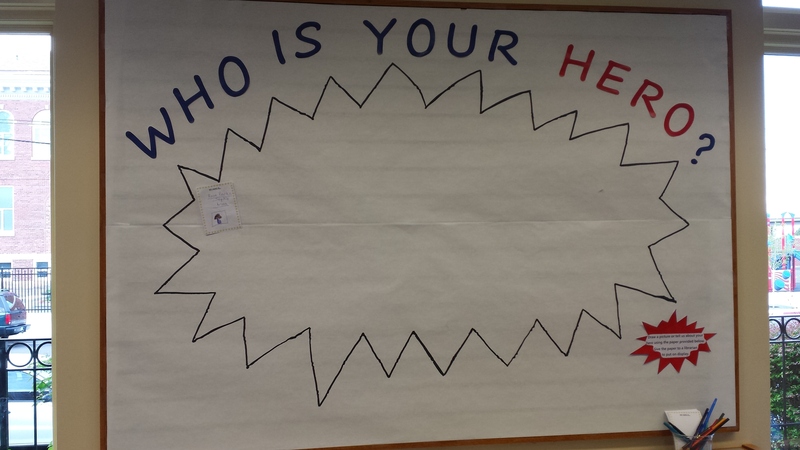 Kudos to another coworker for securing this backdrop. 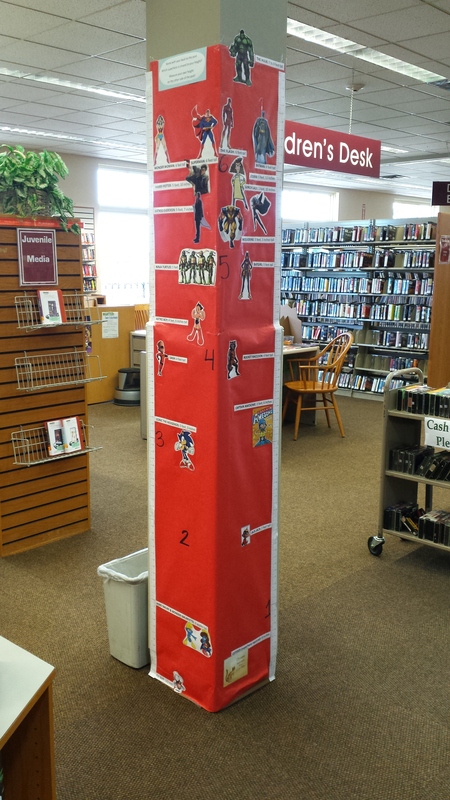 Categories: Other Library Stuff | Tags: library display, summer reading, superheroes | Permalink. You know your visit was successful when you hear them whispering things like “She’s so nice!” and “Will your mom take us tonight?” in the hall on their way back to class. 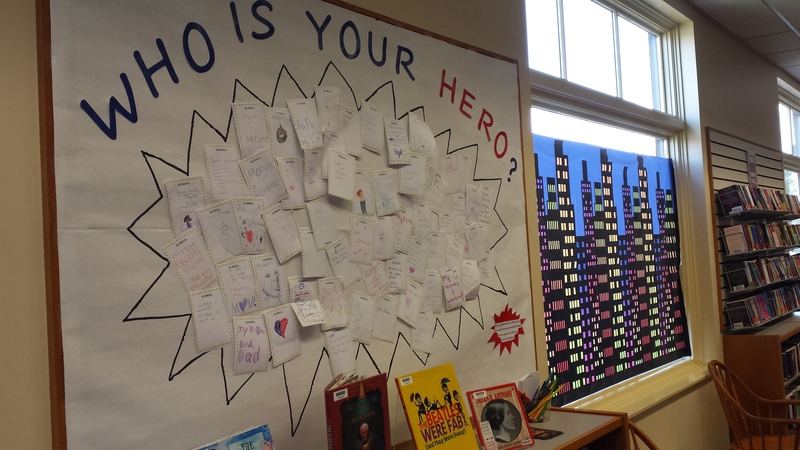 In general, I feel like I’ve been lucky with summer reading school visits. The kids are always enthusiastic and lots of them come in and say hi during the summer. Despite this, I definitely have a strong preference for 4th and 5th graders. There’s nothing better than a room with 50 4th and 5th graders all raising their hands at once to suggest different things that might count towards their reading goal. Or the 10 that crowd around me as I’m packing up to tell me jokes and tell me they want to be a librarian, too. OR when you tell them you’re about to read something scary so they might want to close their eyes, and they do. Magic. -Summer Reading game board, bookmarks, stickers, and any other paper I need to show them. After my spiel I always “quiz” them to make sure they were listening. The best question to ask is your name. They will ALL remember you after that question. I usually give them stickers and/or bookmarks for getting the answer right and they get really in to that. 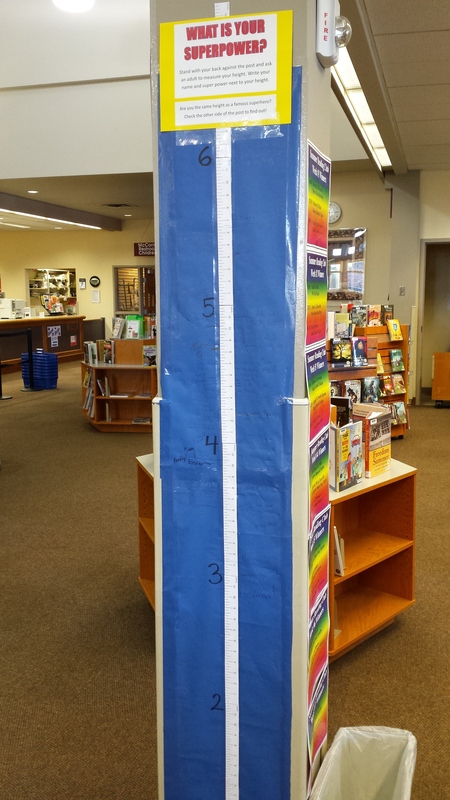 What do you do for your summer reading visits? Categories: Other Library Stuff | Tags: summer reading | Permalink.